Prime Minister Narendra Modi has launched the Stand-up India scheme to promote entrepreneurship among Scheduled Caste/Schedule Tribe and Women. Under the scheme, 1.25 lakh bank branches will provide loans up to 1 crore rupees to SC/ST and women entrepreneurs. The Scheme is expected to benefit large number of SC/ST and women entrepreneurs, as it is intended to facilitate at least two such projects per bank branch (Scheduled Commercial Bank) on an average one for each category of entrepreneur. Composite loan between Rs. 10 lakh and upto Rs.100 lakh, inclusive of working capital component for setting up any new enterprise. Debit Card (RuPay) for drawal of working capital. Credit history of borrower to be developed. Refinance window through Small Industries Development Bank of India (SIDBI) with an initial amount of Rs.10,000 crore. Handholding support for borrowers with comprehensive support for pre loan training needs, facilitating loan, factoring, marketing etc. Web Portal for online registration and support services. The scheme would be led by SIDBI with involvement of Dalit Indian Chamber of Commerce and Industry (DICCI) and various sector. The offices of SIDBI and National Bank for Agriculture and Rural Development (NABARD) would be designated Stand Up Connect Centres (SUCC). Bhartiya Micro Credit (BMC): Sach hua Sapna, Rickshaw hua apna! 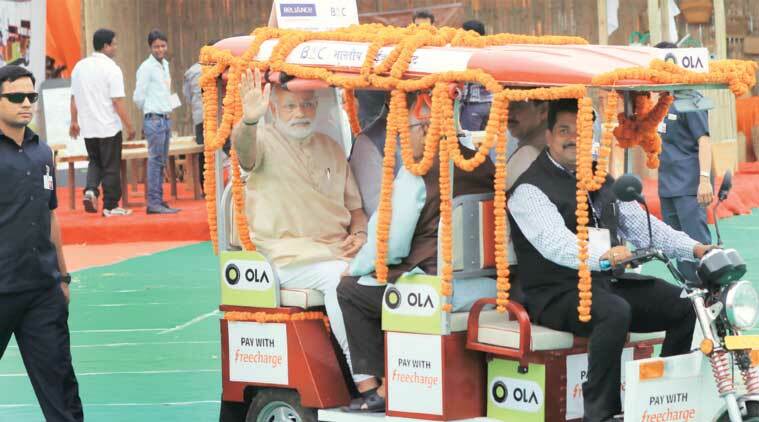 Prime Minister Narendra Modi flagged off 5,100 e-rickshaws under "Bhartiya Micro Credit (BMC)" which aims to spread awareness of the financial inclusion and social security schemes and proposes to take the benefits to poor and destitute people in the country. The idea behind this initiative is to facilitate the up gradation of pedal rickshaw pullers into E Rickshaw owners and help create threefold increment in their income. Credit for all these facilities are being provided under Mudra Scheme. The progression to E rickshaw from pedal rickshaw will also help contribute towards achieving the goals of Swachh Bharat Abhiyan. ⇒ As the first step of this process the pedal rickshaw pullers are provided training post which certificate is provided by NSDC. 150 women drivers have been trained. ⇒ The customers will also be able to book E Rickshaw through Ola mobile apps and make online payment via Freecharge, which will be integrated under the Digital India initiative. ⇒ Under the scheme, charging and service station will also be set up, which will help the growth of emergence of small and micro enterprises along with creating many opportunities for entrepreneurs. Which following bowler holds the record of dismissing Sachin Tendulkar the most number of times in test cricket?